When Tim Guiliano first decided to caddie it was never with the intent of it being more than respite between graduate school and the working world, maybe a year or so toting clubs and playing golf. Now, eight years later his work is as full-time caddie on the PGA Tour for Brandon Harkin. Harkin may not be instantly recognizable but he had a stellar 2018 season earning $1,148,115, making the cut in 21 of 30 events and earning a place in the FedEx Cup Playoffs. Tim Guiliano, left, and Barndon Harkin go over the numbers on the ninth tee of TPC River Highlands during the 2018 Travelers Championship. For Guiliano, that means this is his best year caddying, as well. I’m delighted that you inquired. Guiliano looped at Hartford Golf Club in 2012, his first stint at a club with a bona fide caddie program. I caddie at HGC on weekends and in tournaments. Guiliano and I double-bagged it in the same foursome on a number of occasions. We hadn’t talked in a while when I caught up with him at this year’s Travelers Championship. According to Guiliano, looping was just a way to pay the bills for a year while he golfed. “My goal was to come back and caddie and play as many amateur tournaments as I could,” he said. After the season at Hartford, Guiliano realized he enjoyed the gig so much he headed to Augusta National Golf Club for the winter, thanks to a connection via one of the HGC assistant professionals. Guiliano returned to the Connecticut for the summer of 2013, caddying at Country Club of Darien, then it was back to ANGC for what Guiliano thought would be his last season before he putting his education to use. ANGC is visited by touring golf professionals throughout its season, which runs from October to a few days after the conclusion of the Masters. It was at Augusta where Guiliano met Senior Tour member David Frost, who was impressed with his caddie’s green-reading skills. A few weeks after their round together at ANGC, Frost called with an offer to have Guiliano join him out on tour, which he did for six events, all of which Frost cashed a decent-sized check. From there he hooked up with Web.com player Tim O’Neal and then was hired by Richie Werenski, a Massachusetts native, who had won the 2015 Big Break competition on the Golf Channel. Guiliano was on Werenski’s bag when he won the 2016 Web.com Tour’s BMW Charity Pro-Am. That season Werenski earned enough money tto qualify for the PGA Tour in 2017. The two parted ways in the early part of ’17 and a short time later Guiliano was hired by Harkin. A good caddie always know in which direction the green is located. His job with Harkin ranges from helping determine distance to the flag, including the effects wind and elevation will have on shots. Guiliano also records every shot during a practice and tournament rounds, charting such information as how much difference there was between the true distance and the distance a shot carried, as well as how far the golf ball rolled out upon landing. That information can be used when determining yardage later that day on another hole or even in subsequent rounds. As far as reading greens, “when I get called in its on the hard ones,” Guiliano said. As far as his pay, Guiliano did not reveal specifics but said now most caddies are working for a set fee, which can differ substantially depending on the golfer, and make seven percent of what a player earns if the cut is made and 10 percent for a victory. The first time Guiliano carried someone else’s golf clubs predates his time at Harford and it was for nowhere near those rates. He took on the role of caddie at a club that didn’t even offer such a service. His father was a member at Hop Meadow Country Club in Simsbury, Conn. He golfed with a regular group of guys, including one who liked to walk but not carry. It was that player who suggested, “have Tim carry the clubs.” Guiliano and his dad agreed to the idea. On the occasion when a regular couldn’t make it, Guiliano would still carry two bags, but one would be his, as he had the duel role of caddie and player. 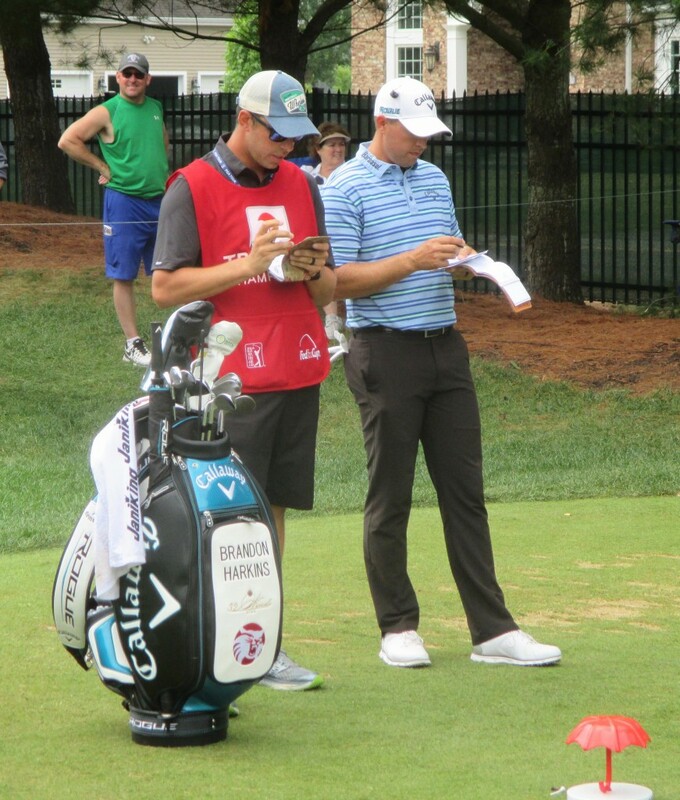 Along the way Guiliano is learning more than about how to be a PGA Tour caddie. Thanks to David Flynn, caddie for tour player Trey Mullinax, Guiliano is getting a lesson in sound golf course architecture. When they are on the road, instead of playing the local big-name courses, Flynn searches out the best designs. For instance, when in the Washington D.C. area for the Quicken Loans National, they teed it up at Columbia Country Club in Chevy Chase, Md. Herbert Barker designed the layout but in 1915 Walter Travis significantly renovated the course adding wild greens and audacious bunkering. 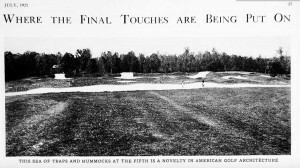 Jim Barnes won the 1921 U.S. Open at Columbia. A massive bunker complex on Columbia Country Club from a 1921 issue of Golf Illustrated. Although the architecture has been tamed over the years, there are still quality features. Guiliano said that under Flynn’s tutelage, he’s come to appreciate great design and that has lead him to realize the mundaneness of more well-known and even famous facilities. “You get to some of the big name courses and I’m like, eh,” Guiliano said. With Harken also having secured his card for next season, Guiliano should have plenty of opportunities to play some excellent layouts in 2019.